To help my foreign friends understand what's happening in this country, I'm going translate the salient parts of these two campaign posters. I believe that the choices of image and slogans sum up the opposing sensibilities quite well. ... a man riding a great big engine into the future. No enigma here. ... a woman. Your sister, your cousin. The expression is ambiguous: smiling but a little smug. The blue poster is about precise targeting, clear promises and detailed programmes. The red poster is about sibling relationships and sentiment. There's a clear attempt to grab the populism agenda on both sides, and simultaneously a completely different approach to how to "do" populism. The blue poster is about concrete things; the red one is about emotion alone. Which direction are the two candidates looking in? Although "right" is used in political parlance to symbolize conservatism, you will notice that Abhisit's body is turned to the left. Yingluck's body language is leaning towards the right, but like Abihsit, she turns to face us, her potential voters. I suspect that the directions that their bodies face hide a subtext. In Abhisit's case it may be something like "You say I'm an elitist, but I'm more left than you think." Yingluck's body, on the other hand, leans towards the right wing, as though populism could be a shield for autocracy - the very problem of which her brother has been accused. Apart from their political connotations, left and right also have other meanings. In graphology, for instance, a leftward slope tends to suggest a pull to the past, and right slant the future. The arrow at the top of Abhisit's poster points rightward and the words speak of the future ... yet Abhisit stands in the other direction. Could it be that they didn't have a trained image consultant who would immediately see that there might be a conflicting signal there? Like the man himself, Abhisit's poster is thick with facts and figures to bolster his message. Yingluck's is a Rorschach blot - you can see anything you want in it. To appreciate Abhisit's poster, you must be able to read. I believe that an illiterate person would, however, be able to get something out of Yingluck's. One tends to think that vague and emotionally-charged slogans tend to carry the day, but to think that is often to underestimate people's intelligence. So I suppose we shall simply have to see. Abhisit's poster clearly shows that he ignores Thais from other parts of the country. His main focus is Bangkok--his world. "The blue poster is about precise targeting, clear promises and detailed programmes." I noted your article with interest. I must say I disagree. The Democrat 'poster' does not work in any marketing strategy. It tries to fit too much information into one small poster. It says too much. 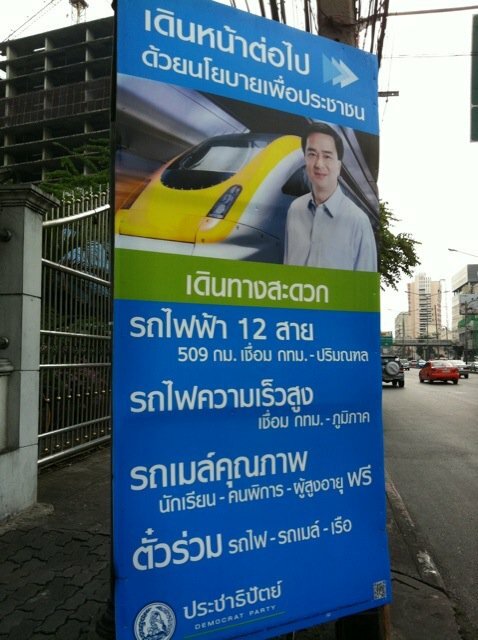 The picture is unrealistic, seemingly obvious that Abhisit is superimposed on a picture of a train. To me, this poster, with good intentions, shows exactly the nature of how the Democrat has run the country in the last 3 years. It tries too hard, and doesn't deliver; its not simple and direct, which is the message that a poster should be. Also PT has election posters stating their promises, those usually are writings with a small picture (without any candidate) on top. It's also been the governing style of mrT, to do, act, fast, direct. 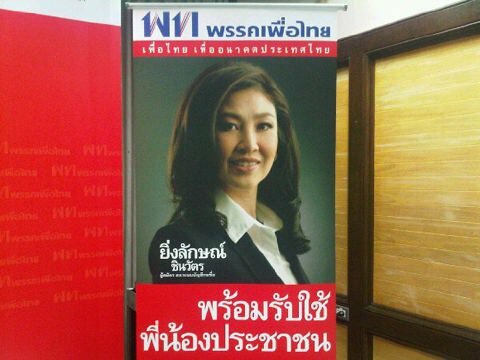 Comparing the introduction of Yingluck to a detailed Democrat poster is unfair and selective. If marketing strategies are microcosms of how they run the country, and if Democrats can't even set a proper marketing strategy with target audiences in mind, well... then how can they run the country? I am no fan of Thaksin Rak Thaksin, Palang Potchaman Party, or the late Phuea Thaksin Party: I'm just saying that 3 years of Abhisit has reminded me that there is no real alternative. He has pretty much tried to be "Thaksin-lite"
It's all a joke, I'm laughing 55555555 get it? I don't read Thai so I have no idea who these people are. The first poster looks like one of those pictures you see at construction sites listing what is going to be built and which contractors are working on it. It's mostly text and a photoshop. The man and the train are facing backwards but the arrow is pointing forward. The other poster looks like a advertising for a real estate agent or a law firm. The picture with the bigger face is better because in the end, you're selling the person. If people trust the person that's what matters. You can promise the world, but if people don't like and trust you, then they aren't going to vote for you.